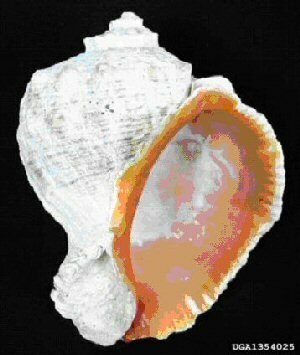 In 1987, the 70th Texas Legislature designated the lightning whelk, Busycon perversum pulleyi (Hollister, 1958), as the official state shell of Texas, joining several other flora and fauna that symbolize the rich diversity of Texas natural resources. It has a limited range from Breton Sound, Louisiana to the northern coast of Mexico, and is a common native in most waters along the Texas coast. 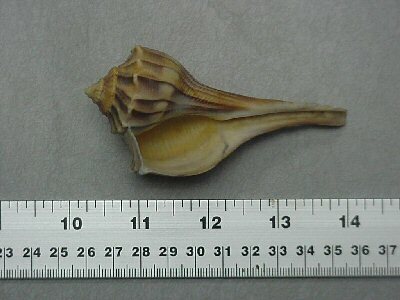 Although one of the largest shells in the Gulf of Mexico, the lightning whelk's unique shape makes it easily recognized among most other shells. The whorls of the lightning whelk shell coil in a counter-clockwise direction, with its aperture (opening) on its left -- an unusual spiraling profile shared by few other shells. This 'left-handed' characteristic is reflected in the lightning whelk's scientific name perversum, from the Latin word perversus, means turned the wrong way. Busycon, from the Greek word bousycon, (meaning large fig) describes the general shape of the shell. The subspecies name, pulleyi, honors Dr. T. E. Pulley, a well known Texas naturalist and teacher. Its common name is derived from patterns of "lightning-like" colored stripes that radiate along the sides of its shell. Lightning whelks spend most of their lives buried in the bay bottom, generally in association with submerged grass beds. They typically occur within bays with higher salinities, in tidal cannels, along the base of jetties, and offshore. Lightning whelks prefer comparatively firm bottoms with scattered clumps of oysters or clams. Although they generally stay buried, the long slender part of their shells can be observed piercing the bottom's substrate as they hunt for food. Like other snails, lightning whelk develop a shell of calcium carbonate that provides support and protection from abusive surf, abrupt changes in pressure, and predators. 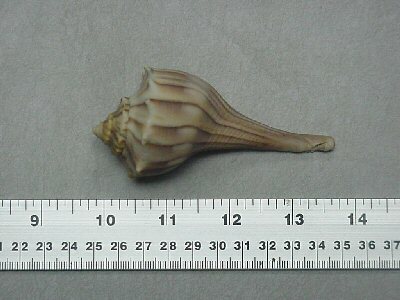 As the whelk grows, a larger shell is produced. 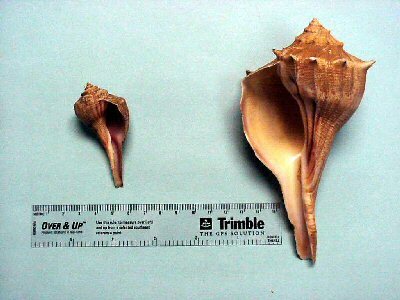 Lightning whelk require 10 to 20 years to grow to a maximum size of about 8 inches in length (largest size normally seen), although offshore specimens have been known to reach 16 inches. While the thick-walled shell provides protection from predators like stone crabs, it also functions as a moving substrate for dozens of smaller species like barnacles which have little effect on the snail. The snail has a small but powerful foot and small head. Its head is armed with a proboscis, a tube-like mouth part, used for feeding. Body parts are often hidden as the snail withdraws into its shell and closes it's aperture with a 'trap door' called an operculum, a dark plate carried on top of the foot made of very tough material that protects the snail's body when retracted into the shell. Primarily a carnivore, lighting whelk prefers live or fresh dead food, but will eat almost any animal matter. Lightning whelks primarily eat small clams and oysters with a unique and ritualized sequence of prey detection and feeding. Finding a clam, a lightning whelk will grasp its prey within its muscular foot for inspection; then open the prey's shell by wedging the lip of its shell between the clam's valves. For more stubborn clams, the whelk will exert tremendous pressure, forcing its shell firmly against its prey's valves, until pieces of the clam's shell are chipped away. Pieces of the outer lip of the whelks shell may be damaged in this process. This chipping continues until an opening is large enough for the lightning whelk's proboscis, armed with a small, ribbon-like radula that has many rows of sharp teeth. With its proboscis inserted in the clam, it rasps away with its radula to consume soft body parts of its prey. Lightning whelk reproduce annually, with mating occurring during cooler autumn months and egg-laying in early spring. Females enclose each fertilized egg into horny disc-shaped capsules while constructing a tough cord-like membranous egg-case string, which connects 50 to 175 total egg capsules. The waxy, cream-colored egg case strings are anchored in the substrate. Each flattened egg capsule can be as large as a quarter and contain as many as 200 eggs. The eggs hatch and the young mature through all larval stages within the capsules. Miniature whelks, with their shells, emerge through designated capsule ports during late spring. Permits and expensive equipment are not required for collecting lightning whelk shells in Texas. With the increasing demand for these beautiful shells, collectors are no longer satisfied to wait for the shells to wash ashore. To meet growing demands, collectors have started removing live shells from their natural habitat causing the population to face overharvest. 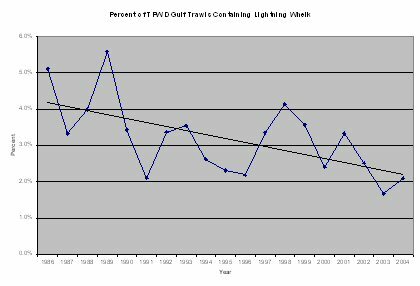 Between 1986 and 2004, the percent of TPWD gulf trawl samples containing lightning whelks has decreased from 5.1% to 2.1% . 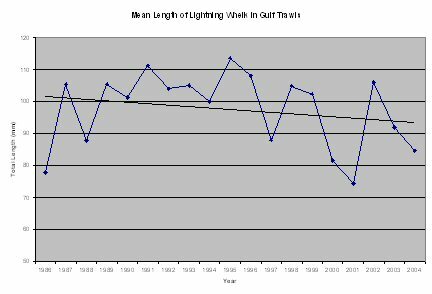 During the same time period, the catch rate (Figure 1) and average size of lightning whelks (Figure 2) have also decreased. Texas has laws prohibiting the collection of lightning whelks and other saltwater and freshwater mollusks. For example, on September 1, 1999, it became an offense for anyone to retain lightning whelks caught in shrimp trawls. In fact, no person on any boat where there is a shrimp trawl onboard may retain lightning whelk. In 2005, the Texas Parks & Wildlife Commission closed the season for harvesting lightning whelks and other species such as hermit crabs, starfish, sea urchins and periwinkles along a small area of South Padre Island from November 1 through April 30. This regulation addressed concerns for the potential overharvest of certain live mollusks and other inter-tidal critters. This new regulation also established a daily bag limit of 15 univalve snails in aggregate and no more than two each in the daily bag of lightning whelk, horse conch, Florida fighting conch, pear whelk, banded tulip and Florida rocksnail anywhere in Texas. Whenever live marine animals are harvested from Texas coastal waters, a current Texas fishing license, with a saltwater fishing stamp, is also required. © Copyright Texas Parks and Wildlife Department. No part of this work may be copied, reproduced, or translated in any form or medium without the prior written consent of Texas Parks Wildlife Department except where specifically noted. If you want to use these articles, see Site Policies.